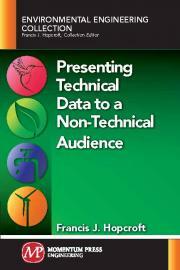 The presentation of technical data is both an art form and a necessary part of any engineer’s job. Most engineers are not anywhere near as conversant with the tools or nuances of presenting technical data, particularly to an audience of nontechnical persons, such as at a public meeting, a meeting of a board of selectmen or aldermen, or at a city council, for example. While it is vitally important to be conversant with the technical details and background of the data being presented, it is equally as important to be able to make the presentation as cogent and valuable to the viewer as possible. This book addresses many of the failings of technical presentations observed by the author over many years of practice. While not proffered as an exhaustive dissertation of all possible issue or problems, this book does touch upon the most import- ant aspects of technical presentations and the most common errors made while making those presentations. Francis J. Hopcroft has been teaching civil and environmental engineering at Wentworth Institute of Technology in Boston, MA, since January 1994. He has written several books on various topics such as hazardous waste management, wastewater treatment, and engineering economics. He served as the collection editor for the Environmental Engineering Collection at Momentum Press since 2013 and has published or reviewed dozens of professional papers, articles, and presentations.